In general, the Dividist prefers CNBC for his daily news fix, as there is a better signal-to-noise ratio at CNBC compared to the usual mainstream broadcast and cable news suspects. On this Super Tuesday, the Dividist was less interested in projections of GOP primary results than a discussion on CNBC about the intersection of the general election, investors and the economy. We have explored the theme of investor reaction to national elections since the inception of this blog, including editions in 2006, 2007, 2008, 2009, 2010, 2010, and 2011. Each time, the Dividist has offered this caveat: Over the long or medium term,we do not think any attempt to correlate political parties in power and stock market performance should be taken more seriously than the Hemline Index or the Super Bowl Indicator. The reason is simple. The federal government does not and can not control GDP, private employment, corporate profits, and/or the stock market as much presidents or presidential wannabes would like us to believe they can. Studies that look for correlation between parties in power and those things that the federal government does directly control (spending, deficits, legislation, armed conflict, and currency) are interesting and informative. For that we can look to political scientists and economists like Niskanen, Van Doren, Mayhew, and Slivinski for answers. But lasting effects on the stock market based on party in power? No. OTOH - Relatively short term market effects around the catalyst of a national election are a different story. Investor psychology and emotion (whether driven by fear or greed or both) can and does drive market movement in the short term. 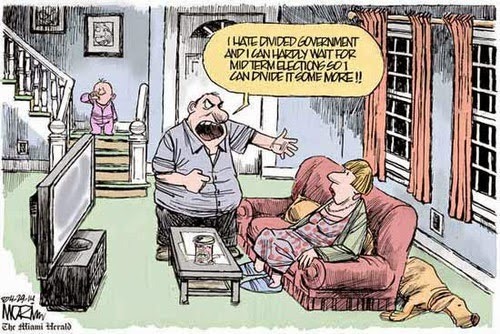 As noted before, if a preponderance of investors believe that divided government is good for the market, it can be a self-fulfilling prophecy. On this Super Tuesday, traders on CNBC's "Fast Money" desk took a look into their collective crystal ball to speculate on how an improving (or not) economy will intersect with the election and markets between now and the end of the year. Ron Insana: "If you listen to the folks at Ned Davis Research who have tracked this back to 1850, a Democratic President and Republican Congress yields the best stock market returns of any possible governmental combination. If you look at the presidents with the biggest gains in the 20th and 21st centuries, it has been Franklin Delano Roosevelt, Bill Clinton, Barack Obama. Now, it may have nothing to do with them. Maybe they just came in on the bottom of a particular cycle." Tim Seymour: "I was just going to say - They bought the bottom." Maybe it means something, or maybe it's a meaningless coincidence as Tim Seymour inplies. The interesting thing about Insana's observation is that he is not just calling out divided government as preferred by investors, but a specific configuration of divided government - Democratic President with Republican majority control in the Senate and the House. As luck would have it, that is the exact configuration currently favored by the Intrade Prediction Markets. As I write this on Super Tuesday, as Romney is being declared the winner of the Ohio primary, Intrade shows President Obama with a 60% chance of being reelected, the Republicans with a 60% chance of taking the Senate majority and a 63% chance of retaining the majority in the House of Representatives. 8 R D D Obama falters with Dem tsunami? This looks like a horse race tout sheet. Your Dividist handicapper thinks only Win, Place, and Show have a realistic chance of occurring. The top two choices are both a prediction and a preference. Ron Insana, Intrade and the Dividist all like the first choice. The biggest risk of Single Party Rule being restored in 2013 is a Republican sweep. If Obama stumbles in the debates, if the economy weakens, it could happen. 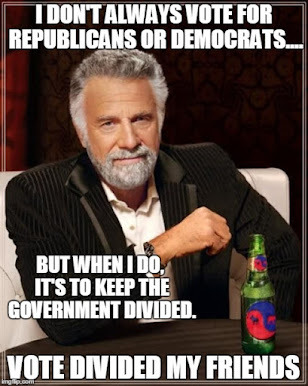 But not if the independent/moderate/libertarianish swingers vote to keep it divided.